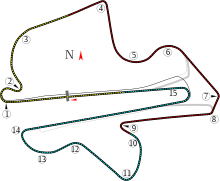 The 1999 Malaysian Grand Prix (formally the I Petronas Malaysian Grand Prix) was a Formula One motor race held on 17 October 1999 at the new Sepang International Circuit near Sepang, Malaysia. It was the fifteenth race of the 1999 FIA Formula One World Championship. The 56-lap race was won by Eddie Irvine, driving a Ferrari, after starting from second position. Teammate Michael Schumacher, in his first race back after breaking his leg at the British Grand Prix at Silverstone, finished second having started from pole position, while Mika Häkkinen finished third in a McLaren-Mercedes. The win gave Irvine a four-point lead over Häkkinen in the Drivers' Championship with one race remaining. This was the first Malaysian Grand Prix since a Formula Holden event in 1995, but the first time at Formula One world championship level. Michael Schumacher returned to Formula One having recovered from his broken leg, and took pole position by nearly a second from Ferrari team-mate Eddie Irvine, with the McLarens of David Coulthard and Mika Häkkinen third and fourth respectively. At the start, Schumacher led away from Irvine, Coulthard, Häkkinen and Rubens Barrichello. On lap 4, Schumacher slowed and allowed Irvine to pass him, then proceeded to block the McLarens. Coulthard forced his way past Schumacher on lap 5 and pursued Irvine for the lead, only for his McLaren to break down on lap 15. Irvine's lead was not big enough for him to stay ahead after his second pit stop, but Ferrari were sure that Häkkinen would have to stop again. He did, emerging in fourth place behind Johnny Herbert in the Stewart. Schumacher slowed once again to allow Irvine to retake the lead, while Häkkinen forced his way past Herbert for third. Irvine duly took the chequered flag one second ahead of Schumacher, with Häkkinen a further eight seconds back. Jarno Trulli suffered an engine failure on the formation lap. This was the third race in a row in which a driver scored his last Grand Prix victory. Heinz-Harald Frentzen took his last win two races prior while Johnny Herbert took his last win at the preceding race. ^ "Grand Prix Results: Malaysian GP, 1999". GrandPrix.com. Archived from the original on 28 February 2008. Retrieved 21 February 2008. ^ "Ferrari wins F1 appeal". BBC. 23 October 1999. Archived from the original on 20 April 2003. Retrieved 6 January 2011. ^ "1999 Malaysian GP: Qualification". ChicaneF1.com. Retrieved 31 July 2007. ^ "Petronas Malaysian Grand Prix - 1999: Startgrid". The Formula One Database. Archived from the original on 8 October 2007. Retrieved 1 August 2007. ^ "1999 Malaysian Grand Prix". formula1.com. Archived from the original on 9 January 2015. Retrieved 24 December 2015. ^ "1999 Malaysian GP: Classification". ChicaneF1.com. Retrieved 1 August 2007. ^ a b "Malaysia 1999 - Championship • STATS F1". www.statsf1.com. Retrieved 19 March 2019. "1999 Malaysian GP: Overview". ChicaneF1.com. Retrieved 1 August 2007.